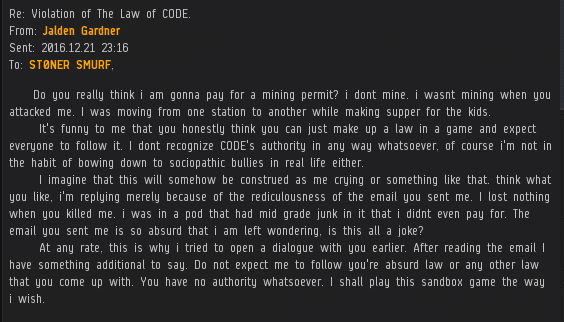 Previously, on MinerBumping... CODE. corporation Vrix Nation took a fearless stand against a truly insidious enemy: People who autopilot in pods through New Order territory. According to zKillboard, CODE. has terminated more than 66,000 pods. Apparently we need to work harder to get the word out. In addition to the ban on autopiloting, the Code forbids carebears from slinking through highsec in insufficiently tanked ships. Pods are somewhat notorious for being light on tank. Vrix Nation's enforcement actions took many carebears by surprise. Their shock and disbelief proved their ignorance--itself a Code violation. Judging by the decline in autopilot usage (especially among shuttles and pods), most carebears are quick to learn their lesson. Not all, though. The great transformation of highsec has come at the cost of my inconspicuousness. I am now the second-most famous EVE player. That's one of the reasons I strive to be a good representative of the game and act in a manner consistent with EVE's values. And highsec's values are the Code's values now. Thus, I have become a living litmus test. If you're against me, you're against EVE. Don't be against me and EVE. CCP will lose subscribers! Manually slow-boating your pod to a stargate is almost as dangerous as autopiloting. Curiously, these "active" pod pilots never choose to warp away when a red flashy Thrasher begins locking them. Trying in vain to maintain their dignity, some podded carebears thank a ganker for delivering them to their destination more quickly. It's a front, obviously, or else they would've self-destructed. Nevertheless, a podded carebear should thank his ganker for sending him on the Pod Express. But with sincerity, not in a spiteful, sour-grapes kinda way. At first, Nill Ashess seemed to be an unusually whimsical Russian. Then he descended into that whole "ships that shoot back" nonsense. Our heroes' search for potential Gallants continued. Yet another example of carebear hypocrisy: They say there's no law in highsec, but they act like we're doing something wrong by ganking them. What standards are they applying to our conduct, if there's no law? Case in point, Jalden Gardner's rant. On the one hand, Jalden says EVE is a sandbox and players can do as they wish. 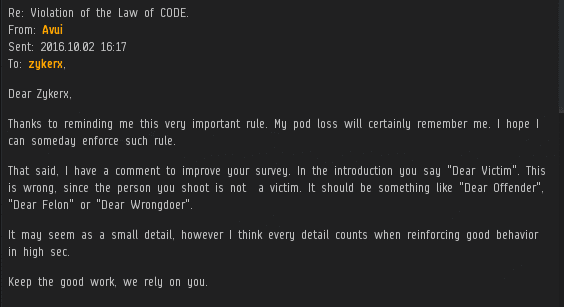 On the other hand, you're a "sociopathic bully" if you shoot a spaceship in highsec. By what measure? With no law to guide us, maybe it's sociopathic to move from one station to another while making supper for the kids. Oh, and note how Jalden throws his kids under the bus. Like he wasn't gonna eat some of that supper himself. A beam of light cut across the darkness. No one can deny that the New Order is reshaping highsec in the image of the Code. There are many who have yet to be illuminated. In time, we'll win them all, one heart and mind at a time. No matter how many dead pods it takes. Stay real tard like loyalanon. Salty anons already here to post tears. So refreshing. The miners like Avui give me hope for rest of the Goofuses. Haaaaaaaaaaah. Took me until installment 4 to get the pun in the title. James never ceases to impress with the quality and quantity of his writing. Where is codex ? Still shadowboxing me.